ah photoshopping again? naughty nasa! 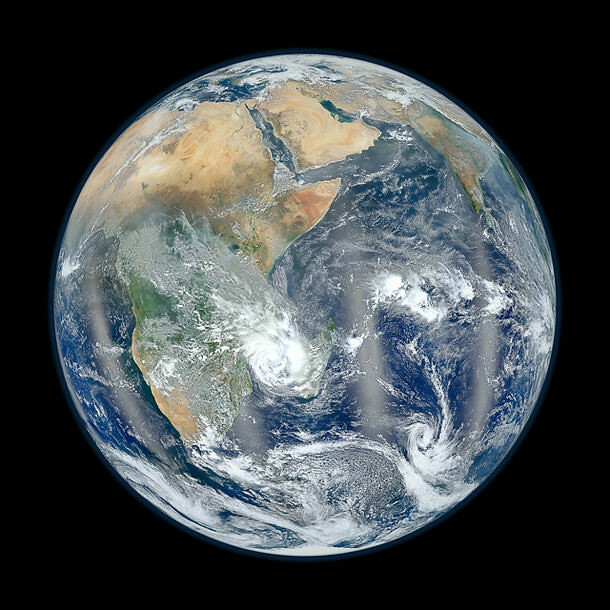 Neither image is taken from a point “over the equator” … which is correct in its own way, but then, NASA’s implied statement that the “circle” of the image shows one hemisphere of the earth is incorrect. Satellites move “up and down” with respect to the equator based on their original launch point and direction of original launch – assuming no mid-orbit maneuvering is done. So, it is reasonable for a low-earth orbiting satellite to be showing images that are NOT symmetric about the equator. So, to correct, the first image – the one showing a “magnified” northern hemisphere focused on the US and Canada – needs to be adjusted based on the actual range. As shown above, it is not showing an entire hemisphere. I did wonder what was wrong, technically it has problems but I didn’t spot the strange projection. ‘spose it is the usual, beware of pushed in your face.